After undergoing a hysterectomy (surgical removal of the uterus), it is difficult to decide whether to exercise or not. In fact, exercise can hasten recovery and help you get back to your normal routine faster. Moreover, exercise after the surgery can help boost your immunity, improve your mood, ease muscular tension and make you sleep better. However, it is essential to seek the clearance and advice from your doctor before starting any exercise. You can’t start with strenuous exercise after hysterectomy – you will have to stick to light exercises at first so as not to strain your abdomen. Abdomen strain can lead to internal injury and bleeding in the tissues undergoing healing. In general, you can start by walking as soon as your doctor clears it. While exercising, avoid lifting any weights heavier than five pounds. Listen to your body; stop exercising if you feel any pain or discomfort. Following are some good post-operative exercises. You can do some basic stretching exercises while lying in bed or on a mat. Lie on your back; bend your legs at the knees. Lift both arms over your head. Press with your hands downward so that you stretch your arms and upper torso. Release and repeat for a few times. Gradually add advanced stretches as the recovery progresses. 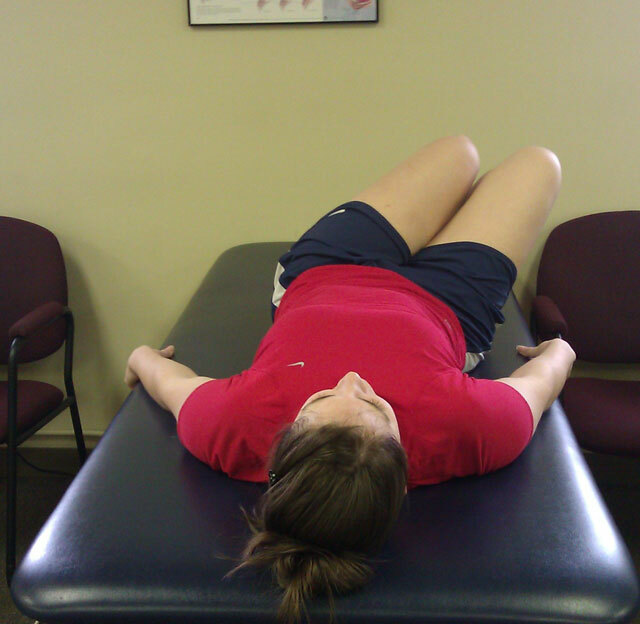 Pelvic tilts, another safe exercise after hysterectomy, starts with you lying on your back. Put a pillow under your head and keep knees bent. Lift your hips off the floor while contracting your stomach muscles. Keep your middle and upper back on the floor. Hold the pose for five to 10 seconds and repeat several times. You can use Kegel exercises to regain your pelvic floor strength after a hysterectomy. Kegel exercises involve contracting and relaxing pelvic floor muscles in a manner similar to stopping and restarting the flow of urine during urination. You can do this exercise anytime, at any place. Lie on your back, with a pillow supporting your head. Bend one leg at the knees while the other remains straight. Contract your stomach muscles and keep your back on the floor. Raise the straight leg and bring it towards your shoulder. Hold the pose for several seconds. Return leg to the ground and repeat the exercise with the other leg. Get down on your knees and hands and take a deep breath. Tighten the muscles of your stomach and exhale slowly. Relax your stomach muscles and repeat several times. Lie on your back, knees bent and arms crossing over the belly. Tighten your stomach muscles against your arms. Gently raise your head from the floor so that your chin presses against your chest. Hold for several seconds and repeat. Kneel down and place a ball in front of you. Put your hands on the ball and lift your feet off the ground while pulling in your navel towards the spine. Slowly roll the ball away from you with your hands until you can feel some strain in your abdominal muscles. At this point, keep your hands steady and stop moving the ball. Lower your body and hips while slowly rolling the ball further away. Maintain the movement until chest starts coming down. Keep your back and chest as straight as possible while moving the ball as far as you can. Hold the pose for a few seconds; then roll back to starting position. Abdominal core exercise may well be the most important exercise after hysterectomy. It is designed to strengthen the abdominal muscles responsible for supporting the internal organs including those undergoing healing. Stand straight with a normal lower back curve. Be aware of the lower abdominal wall (the area below the navel). Pull in your lower abdominal wall towards the spine. Gently contract your abdominal muscles. Lie on your back with a pillow supporting your head and knees bent. Move your knees to your right, then to your left, and then back to the center. Put your feet back onto the floor and relax for a few moments. Breathing might be a bit difficult following hysterectomy. However, you can ease this by following specific breathing practices. Breathe slowly and deeply, letting the air fill your belly, rib cage and lungs. Briefly hold your breath before exhaling slowly.